Mindfulness can make a meditation of anything. Mindfulness is at once the simplest and one of the most challenging things in the world to do. Pay attention to where you are and what you are doing right now. Go ahead. I’ll wait. Were you aware, just for a moment, of were you are, aware of yourself reading a screen instead of focusing what is on the screen? The easy part is slipping into that here & now mindset for a moment. The more challenging thing is sustaining that presence for more than a moment. Stress or any activity that takes skill and concentration makes that kind of sustained mindfulness even more difficult. The classic way to counteract that is by using the exact opposite. Instead of thinking and doing, meditation teaches us to sit and do nothing – even thoughts are released in favor of experience the moment. We counteract thinking with being. In our typical first-world lifestyle, it is very difficult to shift gears quite that far. It is a challenge to go from full mental throttle to full-throttle off. Sitting in traditional meditation is still an effort because it takes a certain vigilance. Our mind wanders very far very easily when it suddenly has nothing else to do. There is a middle way. Another strategy is gentle, repetitive activity that takes a little bit of mental engagement. Something that keeps your mind focused on what you are doing, but isn’t over taxed either. Some activity keeps you here just enough that you still have “processor capacity” to put it in computer terms. A meditative activity keeps you engaged enough that your mind doesn’t wander quickly, yet is automatic enough to let you focus on something else. If you make that “something else” that feeling of mindfulness, or at least make the “something else” some positive emotion such as compassion or contentment…then that low grade activity becomes meditation, just as certainly as traditional seated meditation. My favorite example is a recent episode of the tv show “Mythbusters” where Adam Savage describes the process of making a prop bull whip, and remarks that the repeated braiding is in a way “meditative” (I’ve heard rumors that he practices meditation and would know that quality in its fullest sense, but of course can’t know that for sure). In “Drawing On the Right Side of the Brain” author Betty Edwards describes a phenomenon where artist experience silence as they work. As the non-verbal parts of the brain are engaged in creative, spatial-relationship kinds of activity, the verbal parts profoundly quiet. Whether you think of it in terms of spirituality and enlightenment, or in terms of neuroscience, meditation quiets the mind and lets us focus on here and now. It lets you connect with a simple, repetitive task on a different level. When my daughter was young, “Spongebob Squarepants” was one of her favorite tv shows. There was one episode where Spongebob visits his grandmother and somewhere in the episode she knits a sweater “with love in every stitch”. It doesn’t have to be knitting. Any easy repetitive activity. It might be easy to ‘zone out’ doing it..but what if we don’t? If we keep our mind and heart on what we are doing, it will benefit more than one person. This might be a little woo-woo for you, but just for argument’s sake let’s assume that material things can carry a subtle energy signature. That’s why grandma’s cookies taste better than store-bought. Maybe there really is love in every stitch of the old gal’s sweaters. Making with mindfulness IS meditation. Making with mindfulness benefits the person doing it (gracing them with all the benefits that meditation can offer) AND it benefits the person who uses the thing they made through it’s elevated energy and the good feeling that is transferred. Try it experiment. Bring a bit of homespun science to the notion. If you pray or meditate, try wearing the same jacket every time you do (Ted Andrews suggested this in one of his books). Then put on the jacket some other time. Do you notice any difference in how you feel? Do you notice any shift in your mindset just by associating the jacket with the good feelings of your prayer or meditation experiences? Think of the long tradition of wearing rosary beads or wrist mala. 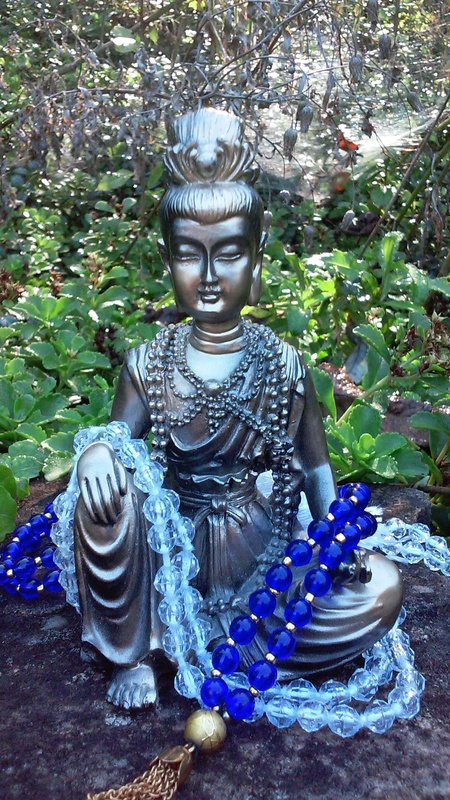 Positive energy is believed to inhabit the beads and comfort the wearer at other times too. Knit a sweater holding thoughts and feelings of love and compassion for the person who will wear it. Hold thoughts and feelings of health and love for those who will eat the food as you prepare it. Do you notice a difference? What do you observe in others? Observation is a legitimate scientific technique. Try it with and without the intention and mindfulness. What differences do you see? What differences do you FEEL? If it helps YOU to feel better, than the practice is worth while just for that aspect alone. They say creation is a sacred act. In the case of simple day to day tasks, it can be a meditative and loving one too. You can live life with love in every stitch. Please leave a message if you would like me to return your call. The Niggles: What is in a name? Pages all are G rated but a few blog posts may have slightly salty language. Everything I do, all Tarot readings, blog posts, books, tutorials, Reiki sessions – everything – is for entertainment and personal enrichment only. These are customized, ephemeral, performance art services. No refunds or exchanges. Use at your own risk. None of this predicts the future, fixes your love life, or replaces professional medical or mental health care. Use at your own risk. No liability real or implied is accepted under any circumstances. No lifeguard on duty. Swim at your own risk. Wash your hands. Eat your vegetables. Please is a magic word.